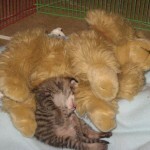 Peaches was rescued from outdoors, malnourished, starving and very pregnant. 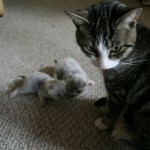 Shown here with her babies. 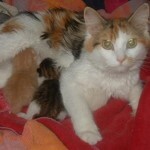 She and her babies were all adopted out and Spayed and Neutered when of age. Giant Tiger - This fellow wandered into Giant Tiger like he owned the world. He then ran out into traffic after leaving the store. He hung around downtown for several days until someone brought him to us. No one ever claimed him. FFL neutered him and adopted him out. Really sweet little boy(pic with stuffed animal) - This sweet little monkey was found howling in a back yard at just 3 weeks old. Seen here sleeping with his snuggly bear. Was Neutered and adopted! 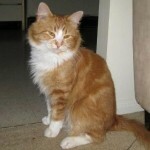 Really sweet boy - This really sweet boy was abandoned by his owner. He no longer wanted him so he merely put him outside and would not let him back in. He was Neutered by us and Adopted out. Tabbi - Nursing mother Alumni. 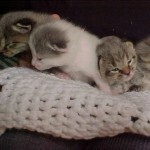 All were adopted, Spayed and Neutered when of age. White Momma - Nursing mother Alumni. All were adopted, Spayed and Neutered when of age. Peaches - Peaches was part of a feral cat colony. She was socialized, Spayed and adopted out. Kitten Alumni 2 - Kitten Alumni. Left in a carrier in my driveway. Bottle fed and adopted out when weaned. All were Spayed and Neutered. 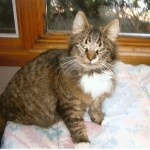 Chelsea - Chelsea was surrendered at 13 years of age as her owner could no longer care for her. She eventually found a home with someone as senior as she. They are both now living out their golden years together! 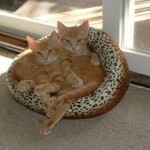 Lucy’s babies – Two of Lucy's babies adopted together in their new home! 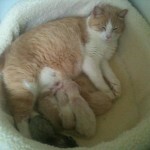 Lucy - Nursing mother Alumni. Lucy was an owner surrender. Her owner never had her fixed and then when she became pregnant she could no longer care for her. Look at all those Red Babies! 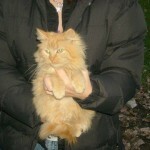 All were adopted and Spayed and Neutered. Kitten Alumni - More kitten Alumni. 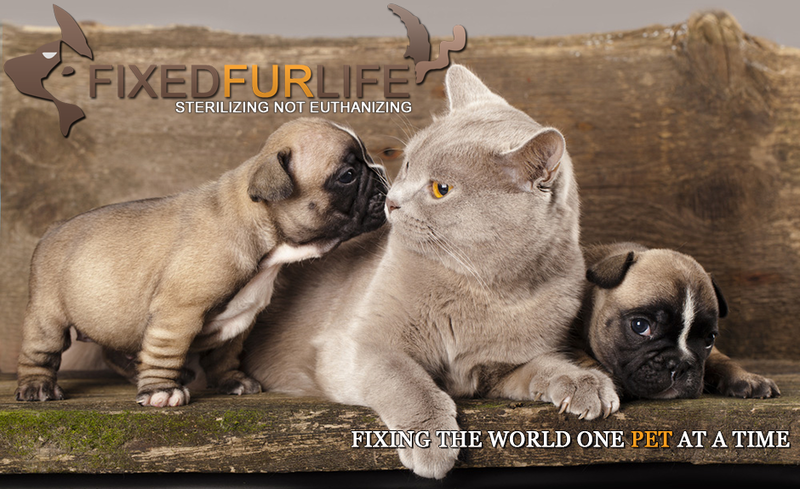 All were adopted and Spayed and Neutered when of age. 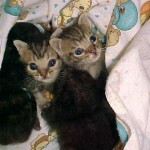 Handsome little ones - These 2 handsome little ones were thrown into a bag and tossed onto a property. Witnessed by the farmer who owned the property. Brought to FFL. Were adopted out together and Spayed and Neutered when of age. 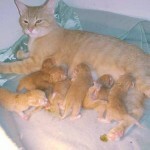 Cassie - Nursing mother Alumni. 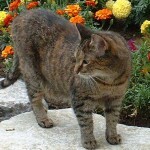 Cassie came to FFL as a pregnant stray. All were adopted. Mom and babies all Spayed and Neutered when of age! 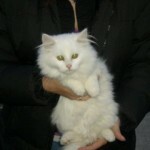 Feral White - This beautiful girl was part of a feral colony. She was socialized, Spayed and adopted out! 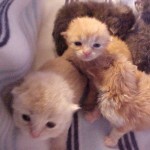 Dumpster Babies - Kittens thrown into a plastic bag as newborns and thrown into a dumpster in - 20 degree weather. Rescued and brought to FFL. I succumbed to the cold weather and the remaining 2 were bottle fed and eventually adopted out together. 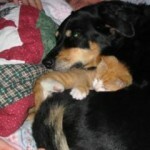 Snoozing Kitten – One of our kitten alumni shown here snoozing with his new canine brother. Stove Kittens - Kitten Alumni. 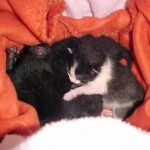 These beautiful babies were found in an abandoned stove outside. All including mom were adopted! All to date were Spayed and Neutered. 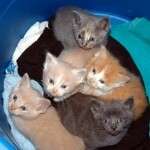 Kittens in a box – These kittens were found abandoned in a box at just 2 weeks old. Bottle fed and then adopted out. All have been Spayed and Neutered. 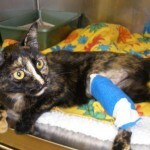 Jasmine - Jasmine came to FFL with a severely fractured leg. 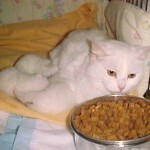 After surgery to repair the fracture she spent 6 weeks recovering in foster care and then was adopted out.